Our values are the fundamental resource that asserts our business making style at Bilim Pharmaceuticals; and Ethical Management is one of our most important values. Our Ethical Management approach is based on our corporate values and business principles while we have been performing our activities successfully for many years. Our Work Ethics Principles not only protect our corporation and employees but also serve as a guide that helps us see the way in the light of all our decisions and activities beyond laws, regulations and procedures. To display our Booklet of Ethical Management, please click. Our Ethical Management approach covers all of the executives and employees of our organization, including the Board of Directors and its members. 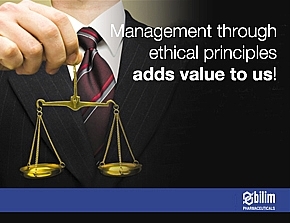 All executives are responsible for ensuring compliance with Business Ethics and Principles. An Ethics Board is comprised of the Chairman of the Board of Directors to ensure that Business Ethics practices are carried out. Problems encountered by employees in their daily business lives concerning ethics, as well as feedback and complaints submitted by employees, suppliers and customers regarding ethical issues are discussed at the Ethics Board. The Ethics Board reaches its decisions by paying attention to the Business Ethics and Principles, which serve as a basis for the work of the Ethics Board, as well as the laws, social values and the founding values at Bilim Pharmaceuticals, and directly reports the decisions to the Chairman of the Board of Directors. Decisions are put in practice with the approval of the Chairman of the Board of Directors.